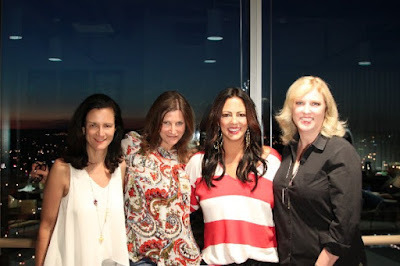 Sara Evans joined members of Change The Conversation last night, where she spoke candidly about her personal and professional journey and performed several songs from her new album, Words, on Tuesday from The Steps at WME. This is a landmark project for Evans as the first release on her new label, Born To Fly Records. Fourteen female songwriters, including powerhouses Ashley Monroe, Caitlyn Smith, Hillary Lindsey, Hillary Scott, Liz Hengber, Sonya Isaacs and of course Evans herself, contribute their words to the stunning, upcoming record. “I want to talk about why we need to change the conversation,” Evans said during the event. “When I first got my record deal, women were dominating country radio. We had Faith Hill, Martina McBride, Reba McEntire, Trisha Yearwood, Lee Ann Womack, LeAnn Rimes, Shania Twain, Patty Loveless and on and on. I was fortunate enough to join that group of amazing women. Change the Conversation is a coalition designed to help create an even playing field for women in country music and was formed by Tracy Gershon, Beverly Keel and Leslie Fram in 2014. It was formed initially to create an informal salon-like atmosphere where women could get together and develop productive ways of solving the problem but has quickly grown into an organization of gaining influence. The organization funds research and hosts events where industry experts address their segments of the industry. The event, which was sponsored by WME and One Hope Wine, began with a conversation between Evans and Tracy Gershon, a co-founder of Change the Conversation who also helped with A&R duties for this album. “Sara Evans has been one of the most influential and admired country artists of the last two decades, so when she spoke about the importance of changing the conversation, the female artists in the room were inspired and invigorated,” Gershon says.